Jason got the first three books in the Bone graphic novel series by Jeff Smith for Christmas. He absolutely devoured them (I have enjoyed them too!) and we followed up by getting the next two. Here is his review. What makes the books excellent? They are funny and they have cute things like the Rat Creature Cub. It has a very interesting storyline. 2. The part when Smiley offers the Rat Creature Cub a sandwich and it turns out to have a giant mouth and instead of just eating the sandwich, it has part of Smiley’s arm in his mouth. And then Smiley Bone says “Sit” and the Rat Creature Cub sits. Then Smiley Bone says “See I told you he was smart”. There are three Bone cousins. One of them, Phoney, keeps getting run out of town and Fone and Smiley Bone always help Phoney get away from the angry mob. And on the latest time Phoney Bone got run out of town, they got lost. They were off the charts.Then Smiley Bone finds a map and asks Phoney Bone for $1. Then some locusts come and they start running. away from the locusts. Fone Bone ends up running off a cliff because he can’t see where he is going. Then he climbs out, goes through the mountain using the map. When he gets through, hefinds a valley where most of the story takes place. 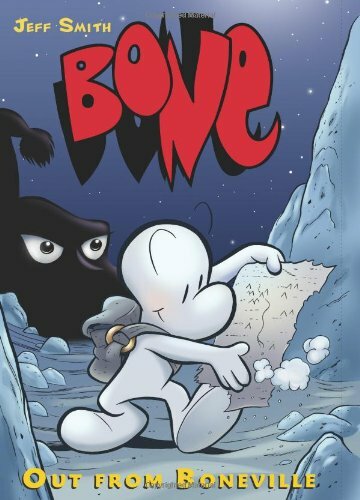 The Bone Cousins - There are three Bone Cousins: Fone Bone, the main character of the book, he is a normal looking Bone with a backpack. Nothing really distinguished. Smiley Bone: Unlike Phoney Bone, Smiley Bone has no money whatsoever. He’s really tall, has this kind of jacket and in the beginning of the book, he is sitting on a rock playing guitar. He also really likes smoking cigars. Phoney Bone: Looks a lot like Fone Bone but he always has a uni-brow plush has a shirt with a star. He is also the richest bone in Boneville (which is where they come from). The Red Dragon - Kind of a relaxed attitude, can breath fire of course. Unlike you would think, instead of scales, he has fur and big floppy ears. He also has a very good sense of humor. He can be tough when he needs to and he is good not bad. Ted, the Bug - He is very small. Got a kind of funny attitude. He is a good guy who is opposing the Rat Creatures. And he always hops around. He also has a big brother but you only see him for a bit. Thorn - Ted ended up mentioning her to Fone Bone because Fone Bone was asking if Ted had seen his cousins. Thorn is a girl, a human (humans have more detail then the Bones) so it looks kind of strange when they are standing close to one another. And her past is sort of a secret. And Fone Bone is also in love with her. Gran’ma Ben - She’s a farmer. She competes is this Great Cow Race in the summer festival. She fought back the Rat Creatures in the War. She can be a little strict, kind of gruff. Her history is also a little bit of a secret. Lucius - His personality is kind of gruff. He runs the Barrel Haven Bar. And actually I don’t know too much about him other then that. But I think he has a crush on Gran’ma Ben. Raque Ja - He’s this giant mountain cat. He says that he is the Master of the Eastern Boarder. He is not helping the Bones but he is not helping the Rat Creatures. He’s also not helping the dragons or the valley people. His personality is very strict. Very powerful. Rat Creatures - Large scary rat monsters with bug-red eyes. They come in different colors. These are the two main rat creatures: a blue one and a brown one. The brown one likes quiche. The blue one hates the fact that the brown one likes quiche and gets very annoyed with him. They are pretty stupid and easy to distract. In one part Fone Bone jumps onto a small branch and says that the Rat Creatures would be pretty stupid to jump onto this small branch. The Rat Creatures jump onto it and Fone Bone says “Stupid, stupid, Rat Creatures!”. Rat Creature Cub - I think he is really cute and funny. Fone Bone found him in Barrel Haven. He must have wandered in there around the time when the Rat Creatures were evacuating the valley. King Dok - He looks a lot different then the other Rat Creatures. He’s got tiny arms with a club. And unlike the other Rat Creatures he is actually pretty smart. The Hooded One - He’s the new leader of the Rat Creatures, apart from King Dok. I don’t know what his personality is like. But he is definitely evil. Lord of the Locusts - An ancient spirit from the Dream Time. I don’t really know what that is yet. And I actually don’t know too much about this guy either except that he probably wants to take over the world.